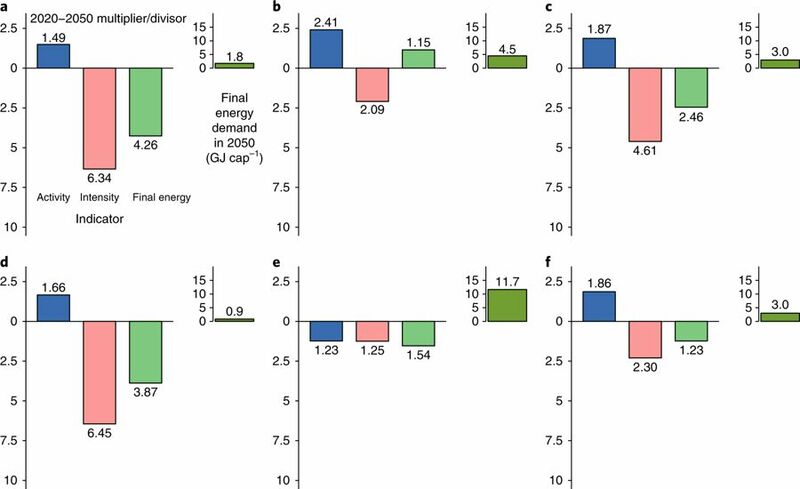 This article, A low energy demand scenario for meeting the 1.5 °C target and sustainable development goals without negative emission technologies, available in free pdf and full text, appearing in Nature Energy last year, demonstrates the practically of degrowth-type energy strategies. ABSTRACT: Scenarios that limit global warming to 1.5 °C describe major transformations in energy supply and ever-rising energy demand. Here, we provide a contrasting perspective by developing a narrative of future change based on observable trends that results in low energy demand. We describe and quantify changes in activity levels and energy intensity in the global North and global South for all major energy services. We project that global final energy demand by 2050 reduces to 245 EJ, around 40% lower than today, despite rises in population, income and activity. Using an integrated assessment modelling framework, we show how changes in the quantity and type of energy services drive structural change in intermediate and upstream supply sectors (energy and land use). Down-sizing the global energy system dramatically improves the feasibility of a low-carbon supply-side transformation. Our scenario meets the 1.5 °C climate target as well as many sustainable development goals, without relying on negative emission technologies. Fig. 1: Decomposition analysis of determinants of LED final global energy demand for end-use services and upstream sectors. Changes in 2020–2050 in total global activity, energy intensity and final energy demand (left chart in each panel; variable multiplier above the x axis, divisor below) and resulting per capita final energy demand (GJ capita–1) (right chart in each panel). Decomposition is represented by variable multipliers or divisors with the direction of change also shown. These are multiplicative and not additive, with the final energy change being the product of the activity and intensity changes between 2020 and 2050. a–c, End-use services for thermal comfort (a), consumer goods (b) and mobility (c). d–f, Upstream sectors for commercial and public buildings (d), industry (e) and freight transport (f).